I recieved an email this week, from Suzanne Davies, asking me to create a link to a blog about photography and getting kids involved in the outdoors. The blog is entitled “100 Resources for Teaching Your Kids About Wildlife Conservation” at http://photographydegrees.org/100-resources-for-teaching-your-kids-about-wildlife-conservation . I responded that I’d check out her blog and I did so. Although the obvious intent of the blog was to promote photography and wildlife, I couldn’t help but notice that there was no mention of true conservation, at least in the traditional form. Conservation means to conserve, which implies use. In my opinion, consumptive use. As a hunter, conservation organizations are Ducks Unlimited, Rocky Mountain Elk Foundation, The Mule Deer Foundation, Pheasants Forever etc. None of these groups are listed among Suzanne’s top 100. Seeing this I am very disappointed. The implication is that wildlife conservation is preservation, which is not the case. Hunting is a major reason why wildlife habitat still exists in the United States. Hunting will continue to provide valuable habitat in the future, unless unknowing individuals create the illusion that hunting is anti wildlife and I believe that Suzanne’s list accomplishes just that. Sorry Suzanne, I don’t know if you ment it that way, but your list needs revision, or you will be doing kids and wildlife a disservice. It was a different kind of opening day at Mayberry this year. Arriving on Friday, I cleaned and vacuumed, toured the property and hauled the final approach duck boat out and into the pond. I used the Honda Rancher to tow the boat, which worked well. After the launch, I found the small craft to be quite seaworthy and stable. This was a welcome find, as at my age, it’s not easy getting in and out of a tipsy boat. 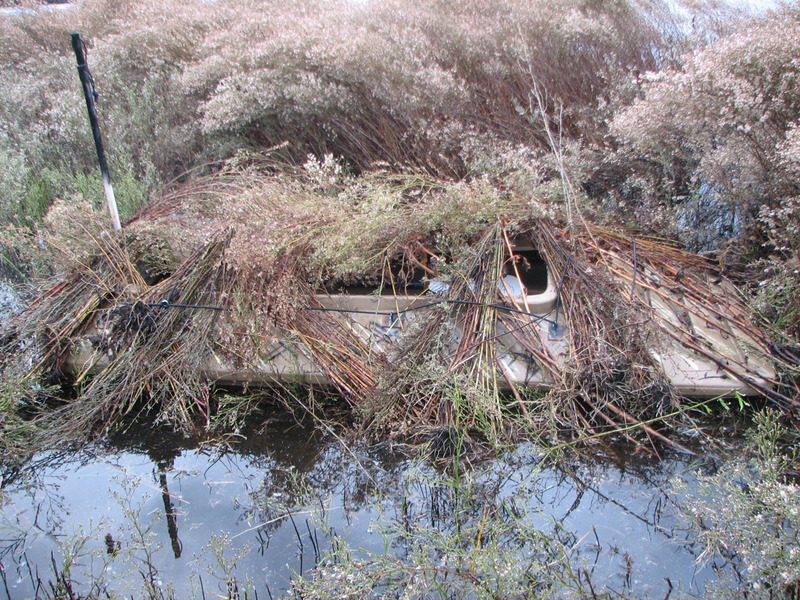 I used some of the aster and cocklebur plants to help hide the boat, using the bungee cord to hold it in place. Here’s what it looked like on Friday afternoon after set up. The boat hid pretty well, and the cloudy weather didn't hurt. 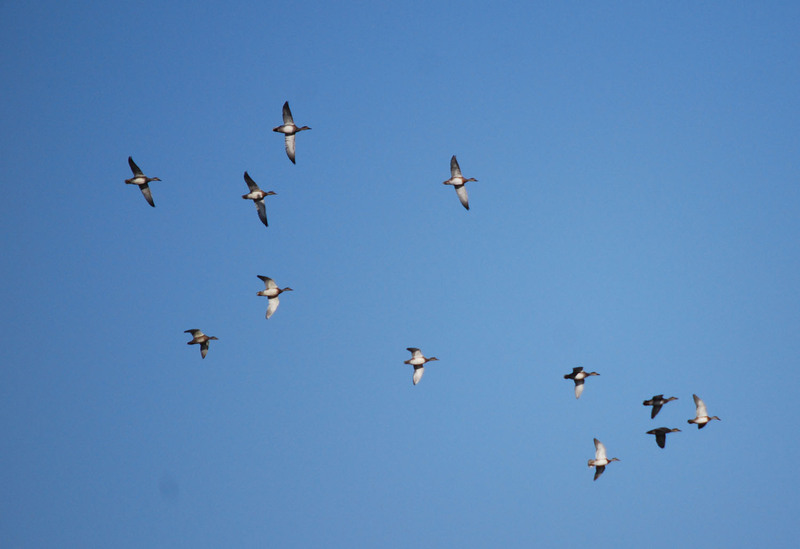 I used only seven decoys, four stand up mallards and three floaters. I placed the decoys along the edge of the shallow water. The open water was about waste deep, just deep enough that my waders leaked when I walked across. After finding out that I had holes in my waders, I elected to travel in the boat. During the morning shoot, I moved the boat three times for a total distance of about forty yards to get to where the birds wanted to land. Bagging only one bird in the first couple hours, I elected to head in to camp for some coffee and dry clothes. About 2:00 PM, I headed out for the afternoon shoot and moved the boat to the opposite shore where I figured I’d get better shots if the birds continued to approach as they had in the morning. I had several good chances and bagged two greenheads while listening to the Giants pregame show. I also missed three others. As Roy Oswald started his windup in preparation to pitch to Andres Torres, a mallard set his wings and passed on my left. With one shot the bird dropped to the water. As Lola swam after the greenhead, Torres lined a single into the outfield and my duck hunt was over. I headed back to camp for more dry clothes, a bottle of wine and a Giant’s pennant. 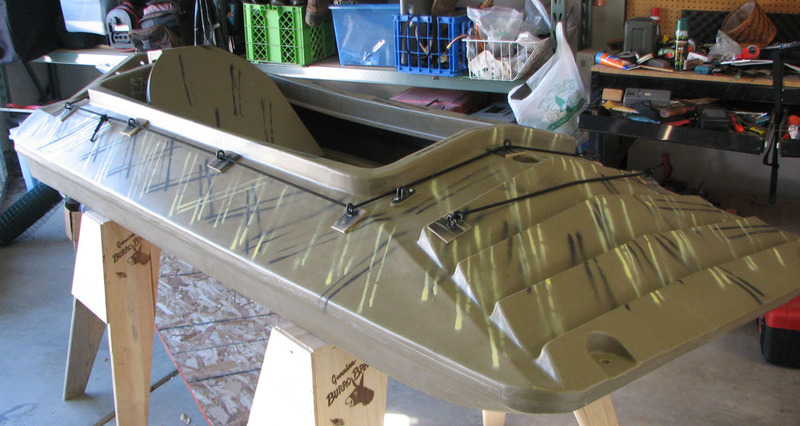 Here’s the boat as it looks in my garage. Decided against the fabric blind and decided to paint it and use bungee cord to hold natural material. I'll cut the material tomorrow and see if the bungee works. I could probably get along without it for the opener, but I’m interested in testing it out. If I get frustrated, I’ll just hide in the cattails. It will look beter in the water than in my garage. I’ll use my gillie suit to cover my body. The other issue is transportation. I’m towing a trailer with my ATV and will put the boat in the back of my clunker F150. Hope I get there. It’s definitely a lot of trouble, but I’ve set asside time tomorrow. Cleaned out my trailer today. Boy what a mess. Got rid of a bee hive and put out decon for rats. Jacked the trailer up and got it nearly level. More work to do, but had to tour the property first. The new canals are open water and most of the areas that have feed are just beginning to hold enough water to attract ducks. Looks like we’ll be ok for opening day. 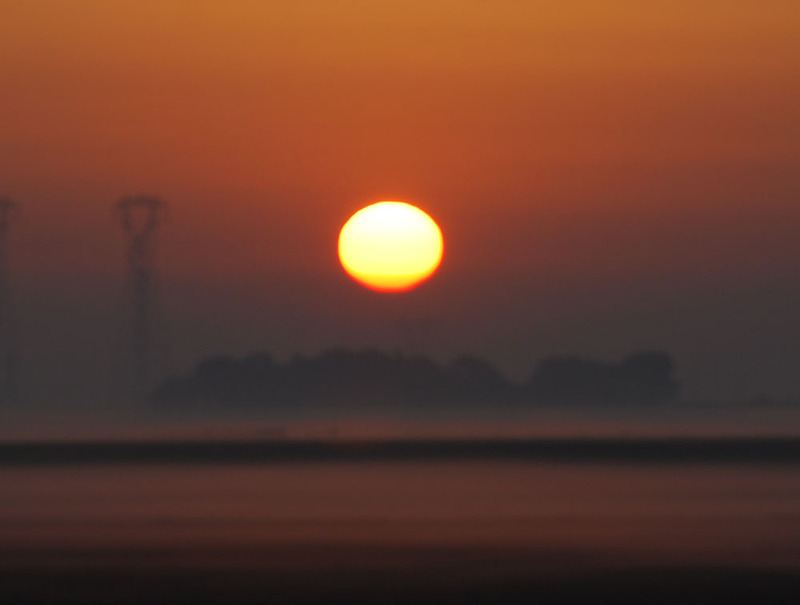 The sun was rising through a thin layer of fog as I arrived. Made a nice photo. 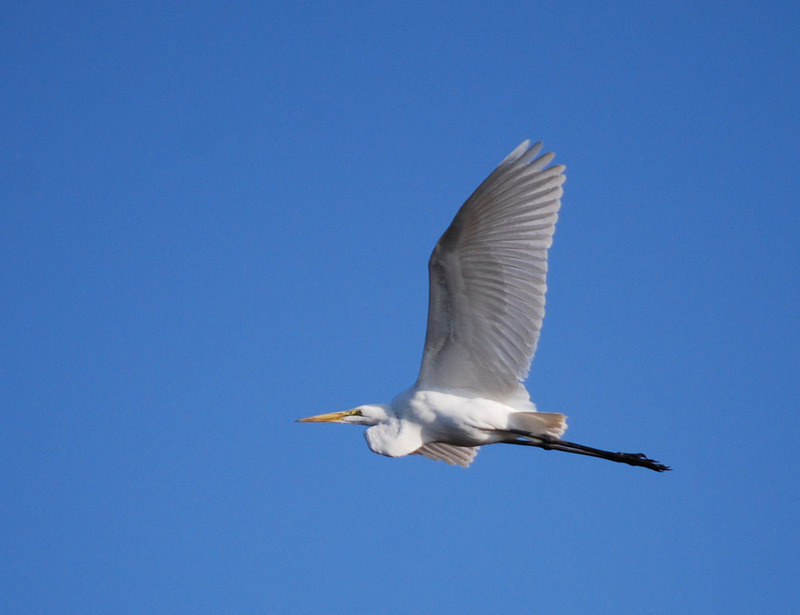 Egrets and herons take advantage of flood up as it exposes lots of prey for them. Ducks were on the water as I arrived. This pond is likely to hold birds on opening day. 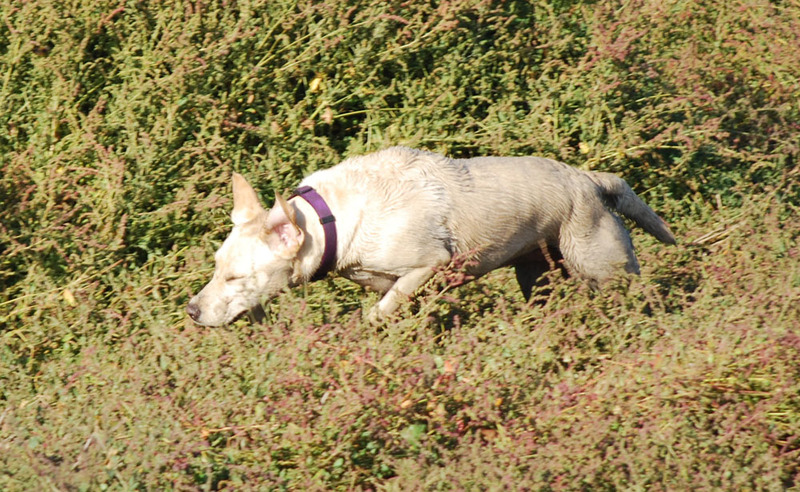 Lola got some scent, but didn't find a pheasant. A few mallards worked the pond and landed. Gadwalls came in as well. That was about it. 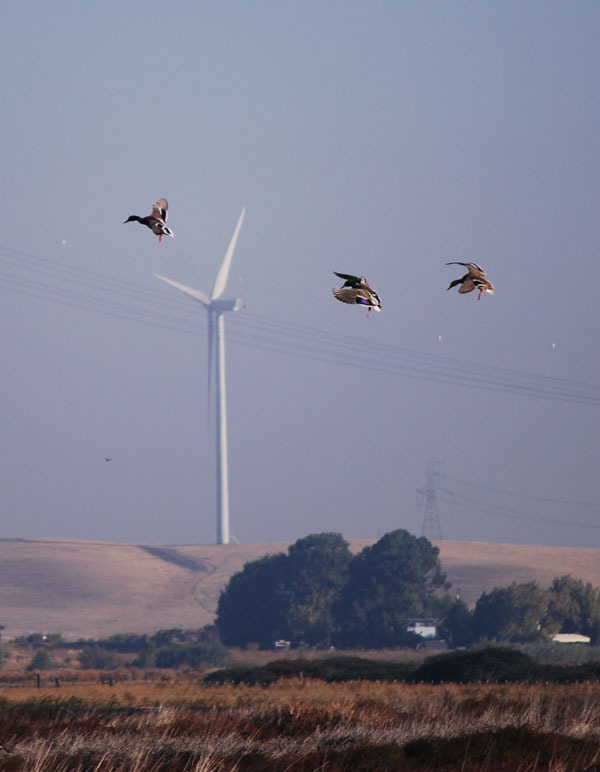 Wading birds, like stilts, sandpipers and phaloropes outnumbered ducks, but I’m sure there will be enough to make things interesting come Saturday. Bryce Canyon is one of the most impressive sights I’ve ever seen. This is a geologic formation created by erosion. In this case, the sandstone earth has been eroded away leaving only a remaining pillar that has been protected by a stone shield on top of it. 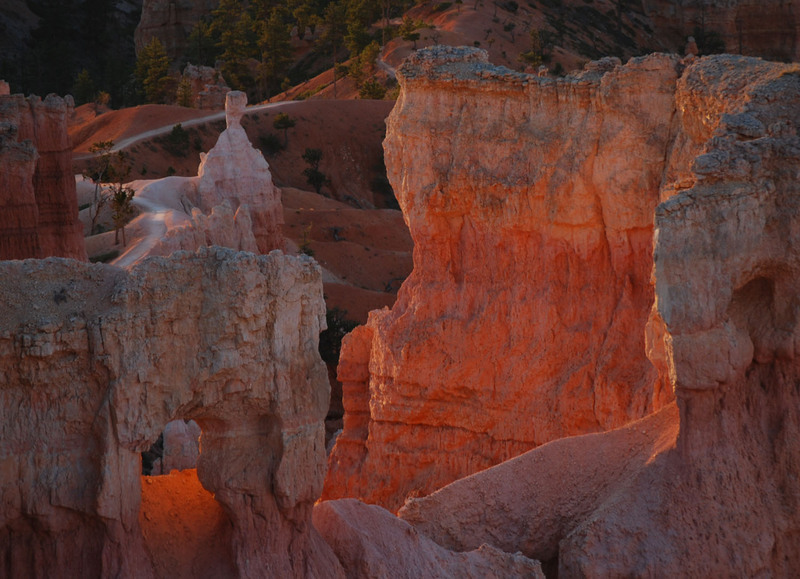 Called hoodoos, these formations are not always colorful as they are at Bryce Canyon, where the red, white and pastel sandstone creates fantastic colors, especially when hit by direct sunlight. This is a photographer’s dream come true. One can learn a lot about photography while filming sandstone hoodoos in varying light over the course of a day. 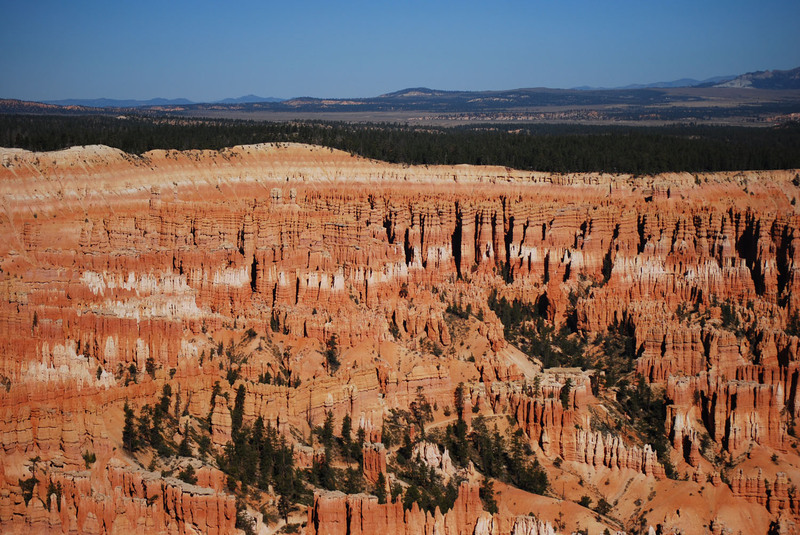 Here are a few examples of Bryce Canyon hoodoos. Here's a panoramic view of the main Canyon. 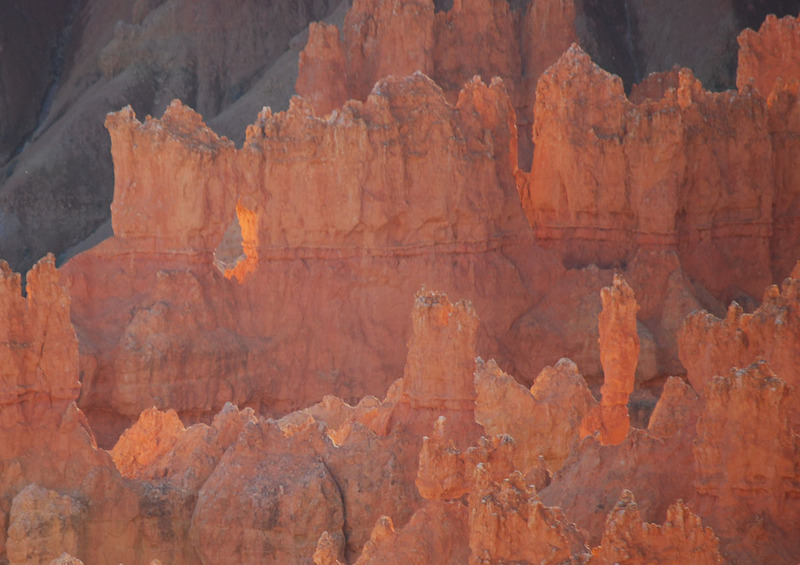 As the sun hits the hoodoos they seem to glow as if lit from within. 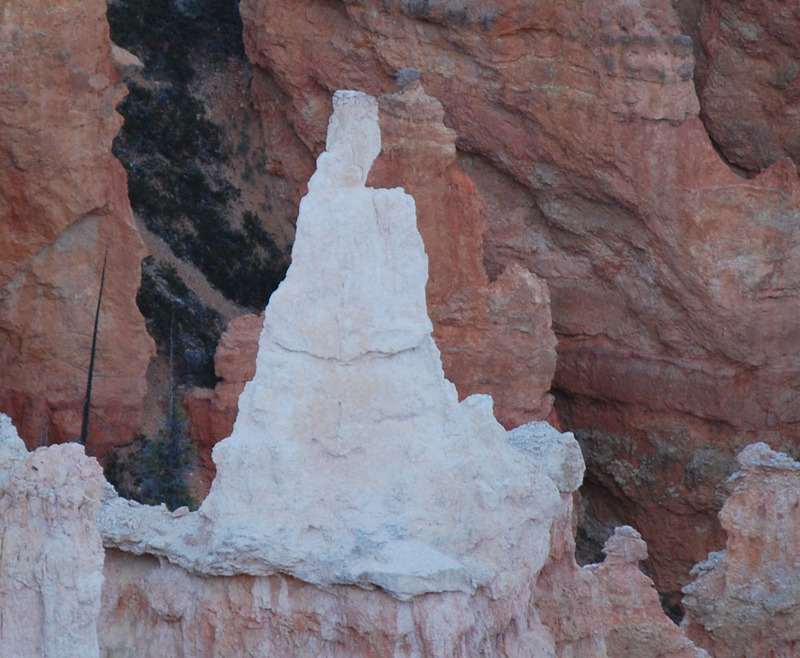 Hoodoos often take on appearances. Here's a formation aglow in the morning sun. I could go on and on as I filled up a 2 Gig SD card and part of another at Bryce Canyon National Park. Like most of us, I’ve seen a few Stellar Jays. 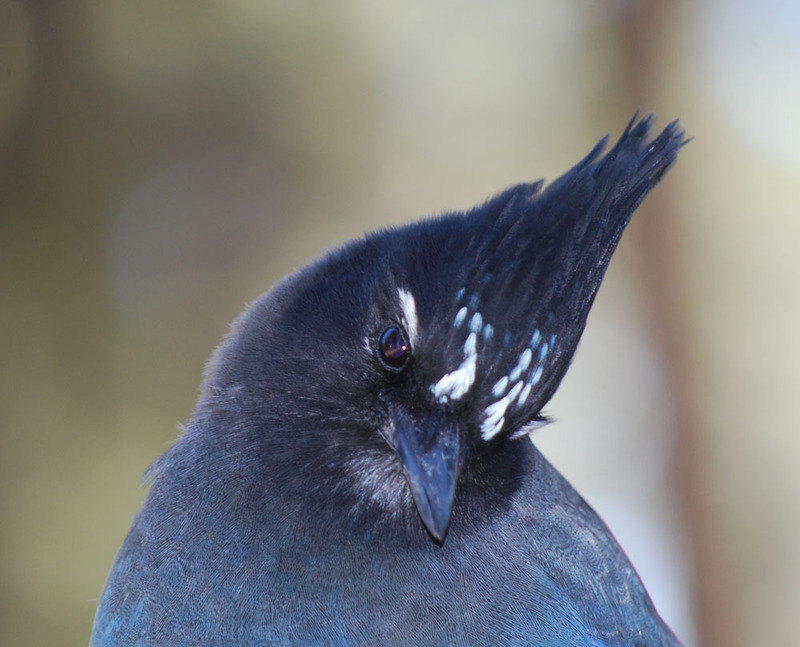 However, I’ve never before noticed that there is more than one model of Stellar jay. There’s the Pacific race and also a Rocky Mountain race. 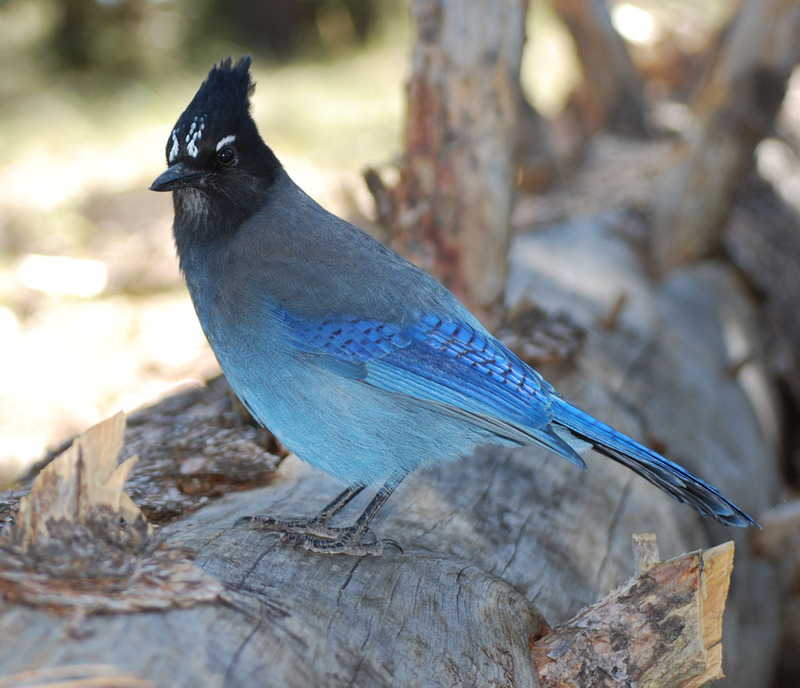 As I sat and ate a sandwhich at Bryce Canyon National Park, a Stellar jay landed next to me and I took a few close ups. The jays on our ranch are not nearly as willing to be photographed as the jays at National Parks. The jay at the top is from Bryce Canyon. 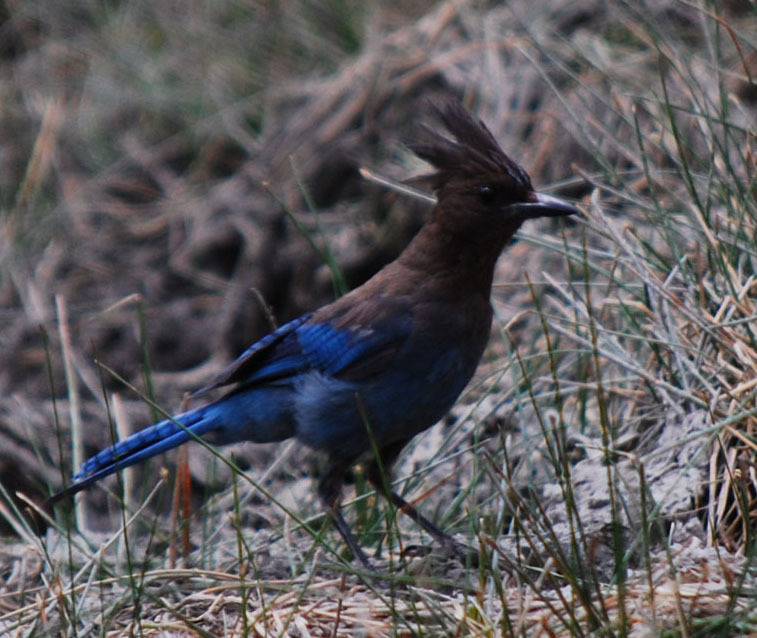 Now here’s a photo of a Stellar jay taken on our California ranch. The Pacific race has slightly different markings and the eye markings are light blue and nearly invisible. Not so with the Rocky mountain version which has white eye marks that are quite visible and a coloring more similar to an (Eastern) blue jay. One of the most unique experiences of my recent trip to Arizona and Utah, was visiting Upper Antelope Canyon, near Page Arizona. 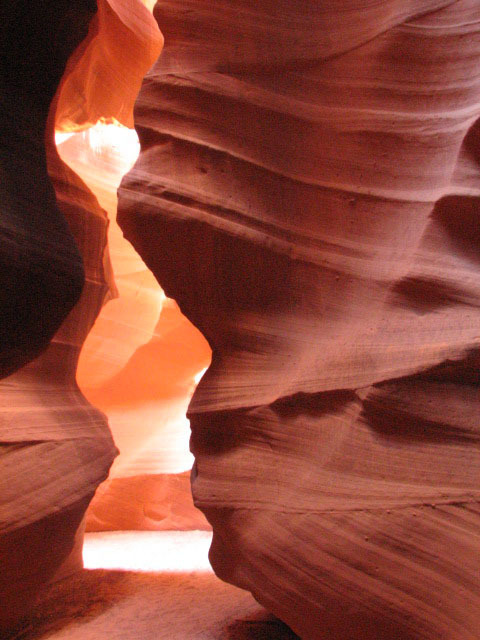 These so called Canyons were created in river drainages where water gushed through sandstone openings, washing out tunnels that expanded with time. Openings at the top of the tunnels let in enough light to create fantastic images. I did not prepare for this trip and had no idea where we were heading, but upon our arrival at Antelope Canyon on the Navajo Indian Reservation, we were greeted by Navajo Chief Slowhorse who helped us adjust our camera settings for optimum results inside the tunnel. With ISO speeds set at 400, our guide instructed me to put my Cannon Powershot in the Program mode. He even took a couple photos for each of us to assure that we would not come back empty handed. After entering the tunnel, I shifted back and forth between Program mode and manual using the camera’s screen as a preview of what to expect. This worked well. Although I’m not 100% certain which photos the guide took for me, I believe that the examples below were photos that I took myself by the experimental method. 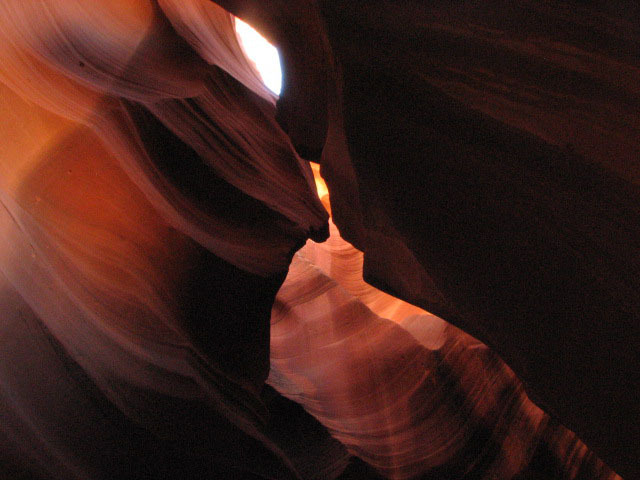 This is a great photographic learning experience and I highly recommend you check out Upper Antelope Canyon if you visit the Lake Powell area. Here are three of the best shots. If I had it to do over again, I’d take the tour and then sign up for a longer visit with more time for personal photography. With a couple hours to work on details, who knows what you might come up with. 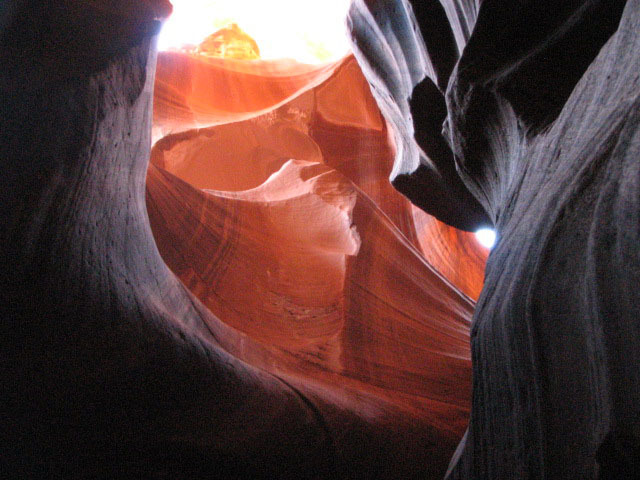 You can find more information about the Antelope Canyons by searching the internet for Upper and Lower Antelope Canyons. You will also find tips on how to get the best photos and many impressive photo examples.